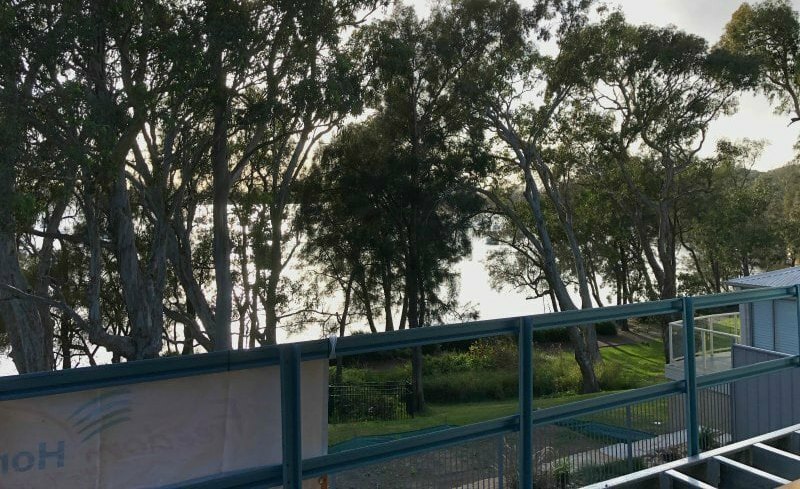 Our team recently constructed this beautiful new home situated in a secluded little enclave on the NSW mid north coast known as North Arm Cove. Like most other blocks of land located in the area, the block was sloping and surrounded by nature. Even though this home is in an area surrounded by bush, the steel frame will ensure that termites are not a problem for these home owners. The new home features 4 good sized bedrooms with built-in robes, a media room and an open plan living space that opens up onto an expansive front deck which has been designed to capture the water views. The home also has an attached double garage with internal access. Light grey render was chosen on the exterior of the home, with white surfmist colourbond windows and door frames throughout. This modern colour scheme adds to the beachy feel of the home. Large double sliding doors allow the cool ocean breezes into the home and ensure that the water view remains a focal point. Entry to the property is via the side, near the entrance to the double garage. Upon walking into the home, you immediately feel the sense of space and light in the room. The entry opens up onto the large light filled open plan living, dining and kitchen space. Inside the home, neutral tones were chosen for the flooring in the main living spaces with a light blue paint colour on the walls which helps to create a calming and relaxed feel. Raked ceilings in the living spaces accentuate the roof height and allow for additional glazing to maximise the amount of natural light entering the room. White walls were chosen in the media room and throughout other areas of the home, providing the home owners with a blank canvas to decorate with their favourite soft furnishings and artwork. The owners wanted lots of outdoor living space in their new home and the expansive deck running along the front of the property certainly met the brief. This large space features modern marble look grey and white tiles and ceiling fans. The area will easily cater for large gatherings and the home can be opened up to seamlessly connect both the indoors and outdoors. The kitchen features a bifold window that can be opened up with countertop installed outside to allow the home owners to interact with guests whilst in the kitchen. If you are looking for a quality custom home builder to help create your new home, please call Freedom Homes on (02) 49648 400 to find out more. We can quote from your plans, or you can speak to our home designer who will work with you to create your ideal home. To see more of this beautiful newly constructed home, click here to view our video.